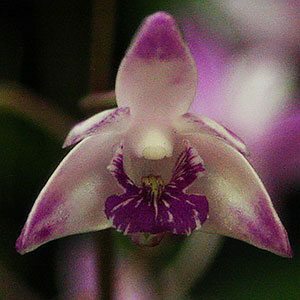 A mostly lithophytic orchid found from New South Wales to Southern Queensland, Dendrobium kingianum is commonly called The Pink Rock Orchid. Being found over a wide area, difference to occur in growth habit and more particularly in flower colour. This is one of the most commonly grown of the genus and it is the cultivars that produce the largest racemes of flowers. 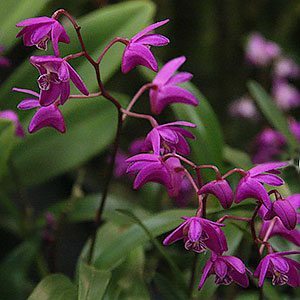 Although it is called the Pink Rock Orchid, flowers come in a wide range of colours from white through to purples and red. The markings on the labellum also show marked differences. Growing naturally in filtered light, growers may use a 50% shade cloth to provide optimum conditions. The higher rating may be need to combat the effect of hot afternoon sun. A second factor that is important is adequate air flow, and given both of these conditions D. kingianum grows well. A mature specimen has this orchid at its best, each flower spike can produce around 15 individual flowers, and with many flower spikes on and established clump the display is magnificent. Also known as the miniature rock orchid, D. speciosum is larger. To maximise flower production, the best time to divide and repot Dendrobium kingianum is immediately after flowering. Most growers use a fairly shallow pot and a pine bark perlite mix. Repotting is usually carried out every 2 years using a clean pot just large enough to hold the root system. After repotting, water regularly and you should encourage good new growth before the cooler seasons come around. As the weather cools, reduce watering and increase light. It is also important to protect these orchids from frost. Winter should see the the new racemes beginning as foliage growth slows. As for the size of the bark used, generally larger plants are grown in larger sized bark. These are a cool growing orchid, they grow well in a fernery, greenhouse or indoors. Humidity – They grow best with some humidity and a saucer of water filled with pebbles to sit the container on can assist with this. Mist spraying in dry summer periods can also assist. Temperature – A temperature range between 25C in summer to now lower than 5C in winter is recommended. Watering – Water well in winter and summer, reduce water spring and autumn. In summer you will need to water every day or every second day depending a little on climate and growing medium. Potting medium – A pine bark perlite mix. Fertiliser – Use a 1/2 strength orchid fertiliser in spring and after flowering. Do not fertilise in winter. Do not use nitrogen rich fertilisers as this will inhibit flower production. Potassium rich fertilisers should also be avoided..
Not Flowering. – Usually this means not enough light, increase the amount of light, however not hot direct sun.